With the WoBLR™, you never have to worry about a wobbly RV ever again. Why? Because the WoBLR is the world’s easiest way to manually level your trailer and reconnect to your hitch! Of course, that’s our opinion, but once you try it, we think you’ll agree. When paired with the RVIQWoBLR app, available for both Apple and Android devices, the WoBLR solves both these problems with a powerful, visual tool right on your mobile device! And once the WoBLR app shows that your RV is level, you can be sure that your trailer is level, because the WoBLR is accurate to within one – that’s right, 1 – degree of accuracy! 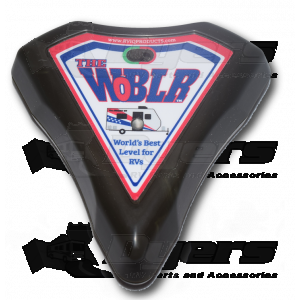 The WoBLR is an affordable aftermarket product designed by RVers for RVers. It can be installed on any flat surface inside your RV (it is not recommended for outdoor use) and quickly calibrated to your specific RV, simply by following our easy-to-follow instructions and instructional videos. Once set up, the WoBLR provides an easy-to-read display on your smartphone or tablet that clearly indicates how far off level you are, how minute changes to each jack and wheel bring you closer to level, and when you have achieved the perfect level you need for safety and comfort.